Lake Ladoga is the largest lake in Europe, and the 14th largest freshwater lake by area in the world. Credit: rusarc. All of the members of our Adventure Race 80dg Regatta have set out. The weather was hardly in our favor. At first we had a sleepless night under the bridges of St. Petersburg. At the most difficult part of the Neva, our yacht, Alter Ego, took a Swedish ISA in tow with strong currents. The next day we arrived at the Osinovetsky Light: a lighthouse on the shore of Lake Ladoga (a freshwater lake located in the Republic of Karelia and Leningrad Region; the largest lake in Europe and the 14th largest freshwater lake by area in the world). In the afternoon, some of us set up the spinnaker (a sail used when sailing downwind), while the rest cooked soup with fresh cabbage and told old tales of their travels. In the evening, we were shown a movie about the ship Sedov on the sail instead of a screen! The smaller boats on yachts are called dinghies. Our dinghy’s engine was acting up, so we had to borrow an inflatable one from the yacht Peter I. But, alas, this dinghy turned out to be in poor shape. We were rescued by the crew of the Polish yacht Lady Dana 44, which towed the two useless dinghies. They brought us to our home yacht, Alter Ego, and, as a sign of our gratitude, we gave them two cans of condensed milk – a proper Russian treat still with some Soviet flavor. We spent the evening doing chores: preparing dinner, feeding the watchmen and scrubbing the deck. Only by three in the morning did we make it to Konevets. We were met on the shore by Karelia’s enchanting natural beauty, stillness and wonderful weather. On a tour the next day, we heard church canon – which especially impressed those of us who had never been in an Orthodox church before. We strolled over to the Horse Stone, got a glimpse of another of the island’s shores... and then got back on board and under way. The next trip, to Valaam, proved to be short and simple, and we found ourselves by the Valaam archipelago. Sometimes the trip wasn't easy at all. Greetings from our whole watch. Yesterday at sunset we docked at one of the ports on Valaam (an island in the northern part of Ladoga and the largest in the Valaam archipelago). The small town of Valaam and the Valaam stavropegial monastery are situated here. At the peak of the white nights we were able to walk around the island with plenty of light. On the same day, we met with some guys from the local small boat fleet, and they welcomed us with a treat of fresh trout. We were then sent on a tour of Valaam’s holy places. Just as when I visited in 2007, the weather was absolutely beautiful – but the monastery was flooded by tourists. We all found the Konevsky Monastery visit more spiritual. It wasn’t long before we saw part of our crew off to St. Petersburg. Volunteers Natasha, Maksim, and famous traveler, director and fantastic storyteller Leonid Kruglov left the Alter Ego. Parting with them was very sad, since they had really become a part of the team; even though the journey had just begun, we had gone through a lot together. Before our friends took off, we managed to convince the driver of a small bus to take us to the other end of the island – to the Gethsemane Skete, where we resumed our photoshoot. 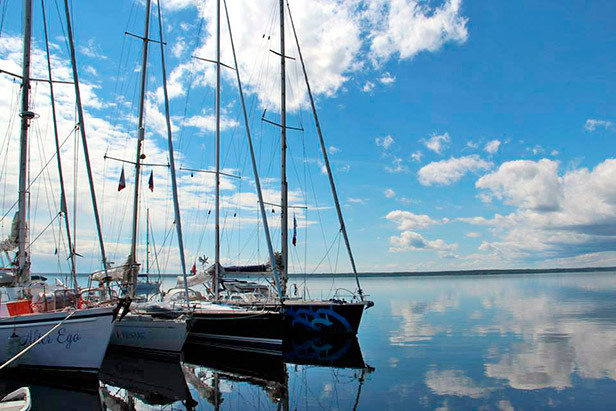 The Adventure Race 80dg fleet departed from Valaam’s welcoming bay. The waters of Ladoga continue to get colder every day. Now the clouds have pulled the sky in, and there was even a strip of fog in which our ships appeared to be mirages. During the night we are supposed to get to the Svir River, along which our path will continue to Arkhangelsk. As the watch cooks potato pancakes, I take in the invaluable, simple pleasures of the life of a traveler. Sunset on Ladoga lake. Credit: Rusarc.